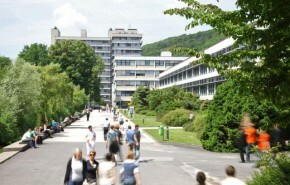 The Johannes Kepler University (JKU) in Linz, one of the most modern universities in Austria, was founded in 1966 as an Academy for Social and Economic Sciences. Teaching and research activities initially began with a faculty focused on academic studies in the fields of social sciences, economics and legal studies, serving a student body of approximately 600. The Faculty of Technical and Natural Sciences was introduced in 1969, followed by the Faculty of Law in 1975. In the same year, the Academy transitioned to become the Johannes Kepler University (JKU), named after the world-famous and renowned mathematician and astronomer Johannes Kepler. The JKU campus now accommodates approximately 16,000 students and employs over 2,000 faculty and staff. JKU currently offers 29 Bachelor, Masters and Doctorate programs. From the start, the JKU depicted a new style of university offering interdisciplinary combinations between the fields of economics, social science, law, natural science and engineering, as well as a concentrated focus on its obligations to the community and economy. Today, the JKU not only provides expertise in basic research, but is also the province’s largest institution of application-oriented research. The Linz cityscape features historic facades juxtaposed with futuristically lit, architecturally acclaimed buildings. There are several new constructions to celebrate Linz’s status as European Capital of Culture 2009 and which have enhanced the broad spectrum of urban architecture. The city has a contemporary cosmopolitan face and its variety, design and creativity are a powerful source of stimulation. Linz provides not only artistic and cultural pleasures, but a welcome haven from the stresses of everyday life. You can wind down on a river trip on the Danube, savour the peace in one of its numerous churches, relax in one of the city’s green spaces or stroll along the river bank. In addition, the city has an energetic cosmopolitan nightlife.